The challengeWe know that the search results’ content can impact… Your conversion rate. People see that the reviews are generally poor or the wording is confusing or it creates questions in their mind that your content doesn’t answer. That can hurt your conversion rate. It can hurt amplification. People who see you in here, who think that there is something bad or negative about you, might be less likely to link to you or share or talk about you. It can impact customer satisfaction. Customers who are going to buy from you but see something negative in the search results might be more likely to complain about it. Or if they see that you have a lower review or ranking or whatnot, they may be more likely to contribute a negative one than if they had seen that you had stellar ones. Their expectations are being biased by what’s in these search results. A lot of times it is totally unfair. The other way you can go about this is the Digital Millennium Copyright Act (DMCA) protocols. You can do this directly through Google, where you file and say basically, “Hey, they’ve taken copyrighted content from us and they’re using it on their website, and that’s illegal.” Google will actually remove them from the search results.This is not necessarily a legal angle, but I bet you didn’t know this. A few years ago I had an article on Wikipedia about me, Rand Fishkin. There was like a Wikipedia piece. I don’t like that. Wikipedia, it’s uncontrollable. Because I’m in the SEO world, I don’t have a very good relationship with Wikipedia’s editors. So I actually lobbied them, on the talk page of the article about me, to have it removed. There are a number of conditions that Wikipedia has where a page can be removed. I believe I got mine removed under the not notable enough category, which I think probably still applies. That was very successful. So wonderfully, now, Wikipedia doesn’t rank for my name anymore, which means I can control the SERPs much more easily. So a potential there too. Registering and using separate domains? Should I register and use a separate domain, like MintedCardReviews, that’s owned by Minted? Generally not. 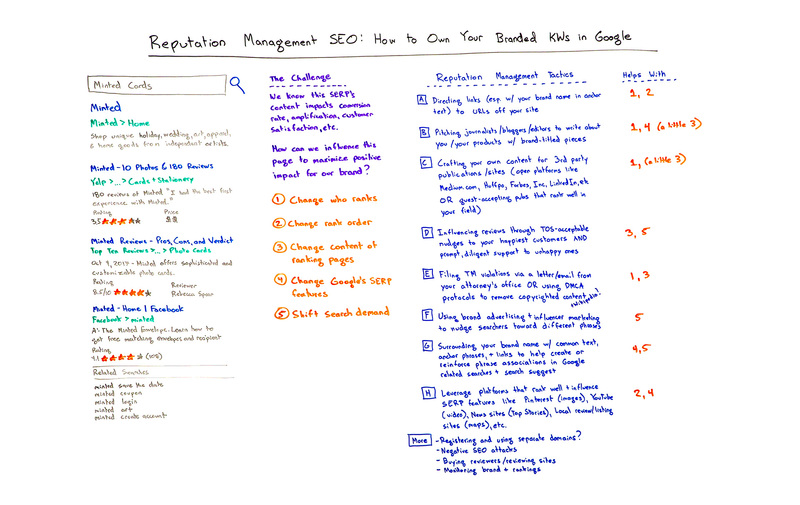 It’s not impossible to do reputation management SEO through that, but it can be difficult. I’m not saying you might not want to give it a spin now and then, but generally that’s sort of like creating your own reviews, your own site. Google often recognizes those and looks behind the domain registration wall, and potentially you have very little opportunity to rank for those, plus you’re doing a ton of link building and that kind of stuff. Better to leverage someone’s platform, who can already rank, usually. Negative SEO attacks. You might remember the story from a couple weeks ago, in Fast Company, where Casper, the mattress brand, was basically accused of and found mostly to be generally guilty of going after and buying negative links to a review site that was giving them poor reviews, giving their mattresses poor reviews, and to minimal effect. I think, especially nowadays, this is much less effective than it was a few years ago following Google’s last Penguin update. But certainly I would not recommend it. If you get found out for it, you can be sued too. What about buying reviewers and review sites? This is what Casper ended up doing. So that site they were buying negative links against, they ended up just making an offer and buying out the person who owned it. Certainly it is a way to go. I don’t know if it’s the most ethical or honest thing to do, but it is a possibility. Monitoring brand and rankings. Finally, I would urge you to, if you’re not experiencing these today, but you’re worried about them, definitely monitor your brand. You could use something like a Fresh Web Explorer or Mention.com or Talkwalker. And your rankings too. You want to be tracking your rankings so that you can see who’s popping in there and who’s not. Obviously, there are lots of SEO tools to do that. All right, everyone, thanks for joining us, and we’ll see again next week for another edition of Whiteboard Friday. Take care.